(Kitco News) – Global stock markets were mostly firmer overnight. U.S. stock indexes are pointed toward modestly higher openings when the New York day session begins. U.S. stock indexes are near their record highs scored recently. 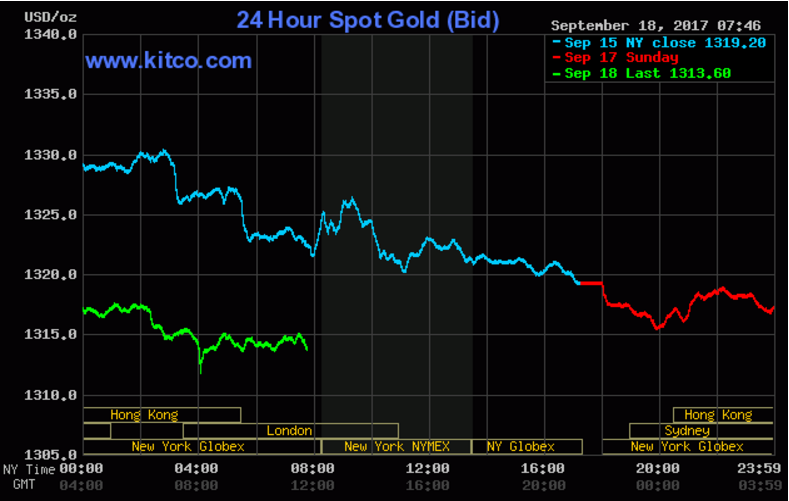 Gold prices are lower in pre-U.S.-day-session trading. Less risk aversion in the marketplace the past week has dented the safe-haven metal market bulls. The markets' highlight of the week is the Federal Reserve's Open Market Committee (FOMC) meeting that begins Tuesday morning and ends Wednesday afternoon with a statement. No interest rate changes are expected from the FOMC at this meeting. However, it is expected the Fed will announce it is drawing down its balance sheet of securities. In overnight news, the Euro zone consumer price index for August came in at up 0.3% from July and up 1.5%, year-on-year. The August report was right in line with market expectations. The European Central Bank said Monday it expects Euro zone inflation to drop to a level of 0.9% in early 2018. However, the ECB said the expected temporary drop will only be a statistical quirk. The key outside markets on Monday morning see the U.S. dollar index slightly higher. Meantime, Nymex crude oil futures are trading slightly lower this morning. U.S. economic data due for release Monday is light and includes the NAHB housing market index and Treasury international capital data.